TechCruch reports on a new tool for citizen journalism: Blottr. It’s described as “a mix of collaborative publishing, ‘authentication algorithm’ and revenue sharing”. Anyone can sign-up and begin writing a news story or making revisions to an existing one, including adding photos or video. Stories are categorised and users are asked to pinpoint the location relevant to the story on a map. Wiki-style, each story has a revision history (to cover the full cycle of an event) and a list of contributors but it’s the ‘authentication algorithm’ that Blottr says make it stand out from other Citizen Journalism offerings. It attributes credibility to each story based on factors like how “influential” the author is on Blottr, how many other people have contributed to the story and how many times its been shared on Facebook and Twitter or been bookmarked. This entry was posted in Citizen journalism, Editors' pick and tagged blottr, Citizen journalism, citizen media on March 1, 2011 by Sarah Marshall. I will now be cross-posting, and/or contributing occasional posts to Global Voices, the US-based founded but global community of more than 200 bloggers ‘who work together to bring you translations and reports from blogs and citizen media everywhere, with emphasis on voices that are not ordinarily heard in international mainstream media.’ Sponsors of the project can be found at this link. My first post for the site looks at the implications of the NightJack case (which I’ve previously rounded up here) with links to some of the best UK blog posts on the subject. This entry was posted in Editors' pick, Legal, Press freedom and ethics, Social media and blogging and tagged blog search, blogging, citizen media, global voices, mainstream media, NightJack, The Times, United Kingdom, United States on June 23, 2009 by Judith Townend. 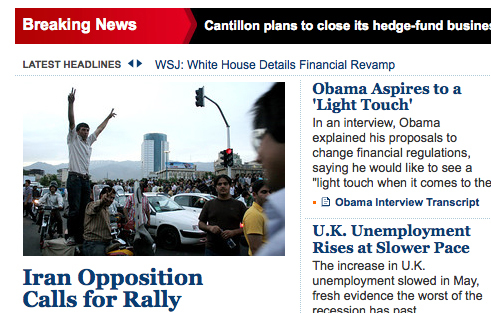 A quick update on the work of pro-am photo agency and news site, Demotix, during this week’s election protests in Iran. Around two dozen contributors have been participating in Demotix’s Iran ‘newshub:’ follow the link to see images. On Wednesday Demotix reported that one of its contributors had been arrested. Andy Heath, the site’s commissioning editor, told Journalism.co.uk it is believed the contributor will appear in front of a judge tomorrow [Saturday] and that Demotix is currently seeking more information. Turi Munthe, its CEO and founder, has made numerous media appearances in which he talked about the use of citizen media during these protests, including the BBC Radio 4 Today Programme, BBC News, and the World Service. Reuters are also featuring Demotix content. This entry was posted in Editors' pick, Journalism, Online Journalism, Press freedom and ethics and tagged Andy Heath, BBC Radio, BBC Radio 4, CEO, citizen media, commissioning editor, Demotix, Iran, iran election protests, Islamic Republic of Iran, Journalism.co.uk, judge, media appearances, news site, reuters, The Wall Street Journal, Turi Munthe, Wall Street Journal, World Service on June 19, 2009 by Judith Townend. In January Rising Voices, part of GlobalVoices, received over 270 proposals from activists, bloggers, and NGOs: ‘all wanting to use citizen media tools to bring new communities – long ignored by both traditional and new media – to the conversational web,’ writes David Sasaki. Five were chosen as ‘most representative of the innovation, purpose and goodwill that Rising Voices aims to support’: Abidjan Blog Camps; Ceasefire Liberia; Real Experience of the Digital Era (China); Nomad Green (Mongolia); Empowerment of Women Activists in Media Techniques (Yemen). This entry was posted in Citizen journalism, Press freedom and ethics, Social media and blogging and tagged China, citizen media, citizen media projects, citizen media training projects, conversational web, David Sasaki, global voices online, Mongolia, representative, rising voices, yemen on March 12, 2009 by Judith Townend. It’s too late now but remember for next year that ribbons can be ordered here. GlobalVoicesOnline takes a look at ‘blogging positively’ here. This entry was posted in Events, Handy tools and technology, Social media and blogging and tagged citizen media, citizen media users, Red Cross, Starbucks, Starbucks Corporation, world aids day on December 1, 2008 by Judith Townend. Nick Hayworth, channels manager of ITV Local London, outlined how the broadband wing of the local TV service was trying to win back favour with its lost viewership – the trick? Mixing citizen journalism and more traditional news online. To maintain the public trust and integrity of each, he added, a clear separation is placed between citizen media and professional journalism on the site. ITV, he says, maintains the standard of citizen journalism content and keeps its 39 local borough channels in London distinct from its traditional news through ‘compliance, labelling and separation’. This entry was posted in Online Journalism and tagged broadband, citizen media, ITV, Local, London, manager, Nick Hayworth on November 5, 2007 by Oliver Luft.